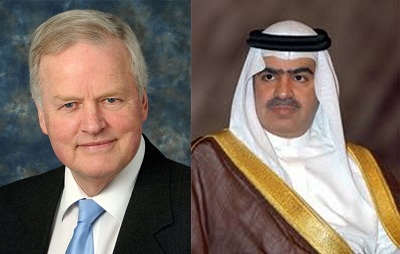 The Ambassador of the Kingdom of Bahrain to the United Kingdom, Shaikh Fawaz bin Mohammed Al Khalifa, met with the House of Commons Member of Parliament and Chair of the Bahrain-UK Parliamentary Group, Bob Stewart, at the MP’s office in London. The Ambassador of the Kingdom of Bahrain to the United Kingdom congratulated Mr. Stewart on being elected Chair of the Parliamentary Group. He also praised Mr. Conor Burns on his outstanding job for the Parliamentary Group during the past years, and the work of Mr. Stewart in adding a number expertise with good relations with the Kingdom of Bahrain to the Parliamentary Group, including: retired senior British Army officer, General Lord Richards, member of the National Security Committee, MP Chishti Rehman, Labour's Shadow Immigration Minister Afzal Khan, Lord John Kilclooney, member of the Science and Technology Committee, Adam Holloway, and the former Shadow Minister for Foreign and Commonwealth Affairs, John Spellar, in addition to other MPs. Mr. Stewart expressed his pride in the friendly relations with the Kingdom of Bahrain, highlighting his keenness to develop these relations through his chairmanship of the parliamentary group and in cooperation with new members. He also shed light on the importance of developing the existing relations of friendship and promote understanding between the two countries as well as incorporate the objectives of political and economic cooperation of common interest, through implementing a series of programs and events that he will aim to achieve during his chairmanship, which will be done through a plan of action agreed upon in the parliamentary group. At the end of the meeting, the Bahraini Ambassador affirmed the Kingdom’s full support to the parliamentary group in carrying out its tasks and achieving its desired goals of expanding cooperation between the two countries, wishing the parliamentary group success in their duties.